Lauren: I’m curious about the idea behind the Summer Reading Series, how it came together for you, the genesis behind it. I know that, at least for me, we were talking and you said ‘We should do a novel!’ and in my head I was like ‘Why would you do that?’ But my mouth was like, ‘Yes, and…’ So as far as I’m concerned, that’s how we got here. But had you, prior to that conversation, talked about doing something like this? Aubrey: I think there were multiple avenues that led to it. Jeremy and I, from the very beginning of Arbor Teas – and because I have a background in performing arts, and worked in the non-profit world for a long time – we’ve always had an interest in the arts, and for maybe about a year now, we’ve kicked around the idea of doing a photography contest, or a writing contest, or something to promote the arts and integrate it into Arbor Teas in some meaningful way, but we never really settled on anything. We’ve been really excited about serials in general, and the return of the serial form, and then we started working with you, and all of the sudden we had this talented and amazing person who could do the thing that we’d been kicking around for such a long time. Jeremy: And as restless entrepreneurs, we were looking to inject something completely new into summertime, instead of spending the summer just talking about iced tea. Aubrey: So the combination of having the talent, having the desire, and wanting to avoid talking about iced tea again all summer long, turned into this wonderful idea: Why don’t we do a summer reading series? Jeremy: Arbor Teas was founded as an organic tea company that emphasizes sustainability in the operation and sourcing of its products. But the longer we’ve been doing this, the more of a given that's become for us. One of the things I’ve been thinking about a lot lately is how Arbor Teas could (and should) do even more to celebrate the things that make tea a multi-dimensional, interesting, and enriching experience. One of our core beliefs and priorities as a company is sustaining the planet and our existence on it, and that’s all for some reason, right? We all care to be here, and there’s this amazing life that we all get to lead while we're here - and the arts and literature are part of that. So, as we've grown over the years - as a company and as individuals - there’s been this convergence in our personal interests in the arts and our convictions about the planet... And so this series, to me, feels really natural. Like, why bother preserving humanity and the planet it exists on, but to celebrate the things that make life worth living? Aubrey: It’s all part of celebrating life and celebrating the people in your life. Lauren: I wonder though if you were at all worried that you weren’t going to see a draft until March 15. Aubrey: I was worried that “The Magic Teapot” wouldn't lend the sort of gravity that we needed. Jeremy: Yeah, that it was going to be too whimsical, you know, to people who aren’t thinking about it in terms of like The Magic Flute, but interpreting it in a more flowery way. Aubrey: And, as you're already well aware, Lauren, my whole interest in this endeavor was to not have it be a marketing gimmick; I really, strongly believed that it should not be a marketing gimmick. Aubrey: How do you feel this experiment [writing a serial] went for you, Lauren? Did you feel you were able to get through it successfully, or was it really hard? Lauren: It was not hard. It was surprisingly easy and really joyful. I took the month of December to write the first chapter because I wanted to make sure I had it down and that I knew who the characters were. After that, I had to write a chapter a week, and when you’ve got a pace like that – and I know that some writers write a chapter a day and are incredibly prolific, but I tend to be a ‘Oh my god did I use the right word?’ kind of writer – I just was able to let that go and just be a writer and not an editor, or a worrier, or a totally neurotic person. Jeremy: So, what were your impressions of the serialized format? Knowing that this was ultimately going to be distributed in serial, how did that influence your writing? Or did it? Lauren: I think that, in a story, you always want the reader to turn the page, to go to the next chapter, to want to read more. So I was wondering, ‘Well couldn’t anything be broken up and be serialized?’ but I think that some things work out much better in a serial form that others. I have a habit of putting books down when I decide that it’s not worth my time to finish it, or I think I know what’s going to happen, or I don’t really care about the characters… And so as a writer, I’m really hard on myself to make it so the story is interesting and compelling, and that you want to read more. I think that thinking about anything as a serial would be helpful for any writer. Jeremy: Would you have tips for other people who were hoping to write a serial? Lauren: I guess I’d say you have to have your initial plot in place at the beginning. You have to know, ‘What’s going to happen in Chapter 3? And how does Chapter 2 relate? And how does Chapter 4 relate?’ You can’t just sit down one day and say, ‘OK this is going to be serialized,’ and then write a bunch of stuff and cut it up. You have to write it with the intention that these chapters are not going to be read one after the other. People have to wait. And if they have to wait, they have to want to come back to it. It’s so difficult now… It’s difficult to get people’s attention in the first place. And to get their attention to let them walk away from it. It’s an interesting experiment, I think. Jeremy: I guess we live in an era of Netflix binging. And I suppose the novel was really the original Netflix binge, where you can go from one chapter to the next to the next. Not that most people read an entire book in one sitting… I guess your advice would be to have it come to you in a dream, fully-formed. Lauren: I definitely have. I really relied on knowing what the story was going to be, at least a little. And it definitely changed. The story changed, and the characters changed, as the story unfolded. So I started out with a spreadsheet. And that’s something that not a lot of writers use, and I never used one before. I went to a writer’s conference in California a couple of months ago, and I started showing my spreadsheets to everybody. Because they were like, ‘What are you working on?’ and I was like, ‘Oh just my spreadsheets.’ And they were like, ‘What are you talking about?’ But I was at the beginning of a new project and I wanted to figure out what the story was, and instead of just you know, journaling, or writing my way into it, which had been a big part of my process in the past, I wanted to be able to really visualize the story and how it would all come together. With a spreadsheet, you can see it so much easier, even if the story changes, you can just go back and make changes to the spreadsheet, so that you always know, chapter-by-chapter what’s happening. Aubrey: I’m curious, looking back at your spreadsheet for The Wintree Waltz, what some of the biggest changes were over time. Were there big plot changes or character changes? Lauren: The plot didn’t change very much. The characters changed. I think that Erin is the character that changed the most, and got fleshed out more. I was surprised at the way things ended for her, and I’m really happy for her. [laughs] I really thought that the ending was going to be very different for Erin. Aubrey: It’s interesting that you say that because Lea and I had a long conversation yesterday as we went through our final edits and were talking about how it changed from the previous version, and we came to this conclusion that in the beginning, when we first read it, in our minds the story was about Jean and Clara, and mainly about Jean and about how what happens to her effected those around her… but our conclusion was that maybe the whole story really was about Erin. And that the teapot really spoke to Erin more than anyone else. 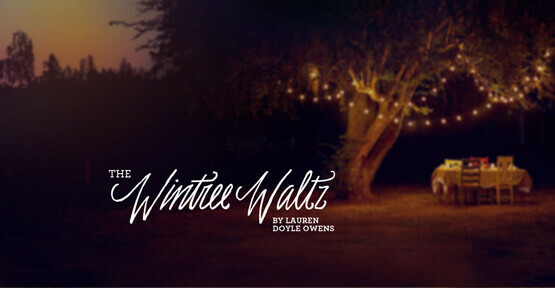 Lauren: Between the first draft and the second draft, I knew that I had abandoned Erin and that I had to come back to her, and that I didn’t really give her what she needed and that I just kind of dropped her for what I thought was a more interesting story. And it’s difficult because there are a couple of characters and a couple of points of view. And to give each of these women their own narrative arc, to give them their own story that feels complete in just ten chapters is not necessarily easy to do, but once the story was over, it felt really good, like, this is exactly where she needs to be right now. And… I find that, if a character does something different or the story ends differently for them, I find that it was always supposed to be that way, and I just needed to let the conclusion arrive for me naturally on its own. Sometimes I think that when you’re writing, or maybe when you’re producing any kind of art, all you have to do is show up for it. And if you show up for it with an open mind, it’s going to happen. Jeremy: That’s pretty profound, but I think there’s a lot of truth to that. Aubrey: Lauren, I’m curious if you ever felt pressure in your creative process to include tea in the novel. Lauren: No! It was never… You know me, and you know that I’m a funny combination between a fiction writer and a marketer, so even though I do have the marketing instincts constantly, for this… it wasn’t like ‘OK I’ve got to shoehorn in this product…’ I mean if you all sold shoes, shoes wouldn't be any more of a presence in the novel than they are now. But… tea is such a big part of my life. And it’s such a big part of my family’s life. I’m one small part of a big family and tea had always been a big part of our lives together. At my grandmother’s house, three o’clock is teatime. And I’ll call my grandmother sometimes when I’m sitting down for tea and I’ll say, “Nana, it’s tea time,” and she’ll say “Oh I just had mine.” So, I mean, sitting around a teapot – well, my grandmother drinks bagged tea – but sitting around with our teacups and talking, is the most relaxing and natural thing to do, and I think it’s such a great way for a story about people to evolve. And a great way to see people’s relationships, and to see how they relate to one another. Lauren: So, Aubrey, I know that you were concerned initially that the story not be about tea, or that people would think it was a marketing ploy. And so when you read the first draft, were you more concerned because… I don’t know if there’s a single chapter where tea is not consumed. Aubrey: I know that there’s still a scene in the book that makes me cringe a little, but I talked it over with Lea and Jeremy, and it didn’t make them cringe, so I think it was just my over-sensitivity to the idea of the project being seen as a marketing ploy, because I didn’t’ want it to be a marketing ploy at all... and if it didn’t mention tea at all, I would have been just as happy, maybe even more happy, [laughs] but I love how it shows tea as something that brings people together. Jeremy: The thing I was most surprised about was that a woman in Florida could write a piece about the city of Ann Arbor here in Michigan so deftly and with such description and accuracy. Jeremy: You did an amazing amount of research about this town that we spent almost 40 years living in. You really nailed it. I mean, there were a few things that only a person who was "on the ground" would know, like you wouldn’t pass this way to go home, but besides that, you did a really great job. Lauren: I find that it’s easier to see something when you’re not overly familiar with it, because when you're familiar with a place you forget to look at it, you forget to see it. The writer Anne Tyler is not from Baltimore but she writes novels set in Baltimore. I grew up in Baltimore, and when I read her work, I think ‘oh you would never do that; you would never drive from that place to that place in the same day.’ But because she’s from North Carolina, it’s a blank slate for her, she can do whatever she wants there. But, she also sees it in a way that you don’t when you live there, because it’s just too familiar. I also really like place. I like to take pictures and I find myself shooting the most ordinary - or what I fear people would think are the most ordinary - pictures and I think, ‘I pass this way every day, why am I taking a picture of this sunset, this is not interesting,’ but for me it’s beautiful, and it’s just this very unique place in this unique time, and I think that’s worth noticing. Aubrey: Were you at all nervous about setting it in Ann Arbor? Lauren: No, I wasn’t. I know that you were nervous about it, and I remember telling you, ‘I’m a writer, I make things up all the time. Don’t worry.’ You would have to be a deep insider in order to see the fissures. Aubrey: Did your trip here influence your story at all? I wonder if you had it all made up before you visited, or if you confirmed what you already knew. Or if, when you came to Ann Arbor, things shifted. I was really happy that you all put me up at the B&B, because I got a different perspective than I did before. I didn’t realize that people have a kind of snobbery about different neighborhoods. Because for me it’s all pretty pricy. So it’s funny to hear, ‘Oh, those people, they’re the worst.’ Or, ‘That’s where the Republicans live.’ But the inn keeper told me all kinds of things that I wouldn’t have otherwise known. She told me about the peonies, and after she described them for me I thought, ‘This has to be part of the story.’ And now it is. What are you most excited about now, with the release? Lauren: This is where my marketing brain comes in… I’m really excited about all of the fun things we have planned for the summer. From Instagram to Pinterest to Spotify… I’m going to post my writing playlist… And I’m excited to do that. But mostly, I really love these characters, and I’m excited for other people to meet them. It’s not a heavy story. It’s summer! And, for me, it’s the perfect story for summer. 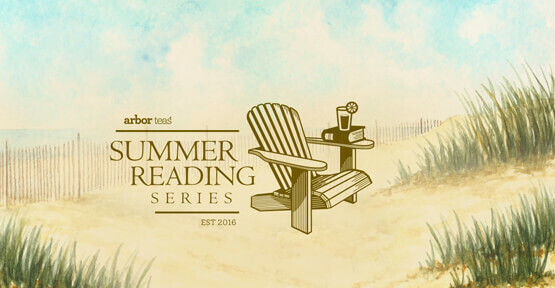 Learn more about the first selection of the Arbor Teas Summer Reading Series, The Wintree Waltz, and sign up for chapter release notifications here.